I am a 969er, Buddhist and peacemaker. You are a supporter of Islam terrorists. 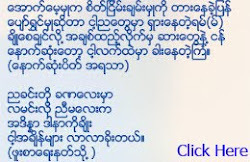 This poet, you (Kaung Kin Ko) is also a terrorist because of this poem. You may receive the support from Islamic terrorist org. Real 969ers are not terrorists. They are creating peace among all human beings. Politicians, medias, writers and poets like you are foolish because of supporting Kalar Islamic Terrorists. Bravo Kaung Kin Ko! You are good ideologist. You expressed what was really happening in community where the 969 terrorist were supported by some of buddhist who are very nerrow minded. Buddhists sh protect the image of buddhism by condemning 969.